Any recommendations for finding good men’s business casual shirts? My husband’s ultra casual office (tshirts and sweatpants were not uncommon, especially on his night shift) is becoming “business casual” next month. We’ve found several pairs of appropriate pants he likes, but shirts are another story. He has a long torso and long arms, but most tall versions of shirts are also big, and he’s pretty thin (6″, 160 lbs). Land’s End Canvas was very ill-fitting on him, JCrew was closer, but pricey. If J. Crew fit, try the J. Crew outlet. Should be cheaper by about $25. Also try BR and their outlets. They have “slim fit” shirts which should work well. Express Men – I have a couple brothers who are the skinny necked/long armed variety. Like, they would be a Small Tall, if BR (or anyone) made such a size. Express has an Extra Slim Fit cut that worked a lot better than about anything else we found. You can try Eddie Bauer. Brooks Brothers is having a sale right now on $44 shirts, many ‘extra slim’ – may be worth a try. Nothing is final sale. Seconding BB sport shirts–slim fit, no iron. Jos. A. Bank “tailored fit” shirts. They are almost always on sale, but sometimes not instore (online only). Alan was kind of squat, but he got alot of his clothes at Joeseph A. Bank’s. He said it was as good as Brook’s Brother’s, but my father said it was less expensive but that was all, and I trust my father because he does NOT drink like Alan. If you want a place that is less expensive, and your husband can fit into clothes, then go there. Otherwise go to Barney’s. Mexx is great for shirts for slim/thin guys. Gap has a slim fit shirt for men. LL Bean’s slim fit tall clothing is my husband’s favorite for long sleeved business casual clothes. Nordstrom have tall sizes that are not big also. They have some “slimmer” cut ones in tall sizes. Their white “John W Nordstrom” line are nice fitting, good quality materials and come in a variety of tall sizes (starting from medium tall up to XXL tall). How does everyone feel about knit scarves indoors? I love my silk scarves something fierce, but long knit scarves in the office seem a little “off” to me. In other news, I looked at duck bacon (YES THIS IS A THING) on the D’Artagnan website this morning, and now there is a duck confit photo ad following me everywhere today. I wear knit scarves indoors quite frequently. It hadn’t occurred to me that one wouldn’t! But then I am a fool for scarves. I do woven scarves indoors from Target) more often than knitted/crocheted scarves. lol if you look at Pinterest (copying over Polyvore outfits) at all, you’d think that a brightly colored scarf + matching flats is required of all outfits, inside or outside. Isn’t it? That is the foundation of my entire wardrobe. Oh no. I unfollowed everyone who posts hipster manic pixie dreamgirl shots; I just use Pinterest for making boards of 20th Century dictators doing funny faces. And jewelry, sometimes. But Kanye — what if I dressed up AS a manic hipster dressing up AS a 20th Century dictator and made a funny face and then put it on pinterest. And there as a scarf and flats involved. Could we be friends then? Oh dear no. I can’t even be trusted with a cup of water near my computer, do you think I’m allowed on a fixie? Just kidding. I swear I’m not a hipster. Hand to god. I don’t actually look at anyone else’s pins on Pinterest. I just use it to keep track of stuff I like without a bazillion bookmarks. Is that so wrong? I know it’s supposed to be a social media site, but…meh. 1). Any outfit looks chic on Polyvore. Seriously. Someone could make a Polyvore of sweatpants, a 5k race tshirt, a reusable grocery bag, ballet flats, and a matching scarf, title it “vintage casual” and people would repin it. 2). Most people don’t really want the outfit they “WANT!!! !” They want the skinny body it’s draped over. Otherwise I do not understand why so many people want to wear seafoam green skinny jeans. 3). Maybe I’m weird (and by maybe, I mean I probably am), but I find those photos of posed, sleeping, brand new newborn babies kind of creepy. Especially when they’re not clothed. It’s just way too uncanny valley for me. Hahahahaha totally agree with all of this!! I’m not on Pinterest (I know…what am I some kind of neanderthal) — but I have to agree on the baby thing. I mean, especially when there in weird things like bath tubs and stuff. Me neither. Enough of my workday is already devoted to Corporette. re #3… I read a blog that showed the ‘behind the scenes’ for the creepy newborn photos and it was so bizarre. The photographer has someone holding the newborn’s head up and then photoshopped the picture to look like the baby was resting in that bizarre pose. It made the whole thing even creepier to me. The newbown photos I have of my son were taken by the hospital photographer and look totally brokedown. My baby was ‘overcooked’ with peeling skin all over his hands and face, his eyes were all swollen, and his head was cone-shaped. But I prefer those over the wacky photos of newborns in knit stocking caps or hanging in crocheted bags. WHAT IS UP WITH THAT?! How about photos of newborns dressed in matching scarves and ballet flats eating duck prosciutto? I’d buy the calendar. YES. Especially if the baby had a ponytail holder around its wrist and a single blue painted nail. Duck prosciutto is awesome, so I bet duck bacon is fabulous too. I wear knit scarves/pashminas indoors sometimes. I cannot adjust my office A/C, so sometimes I need a scarf. I got some amused smiles the first few times I wore one, but my coworkers are used to it by now. I would wear Kat’s recommendation in the office. Okay, you and goirishkj are the first ones to get the point of this little thread. WINNERS! Does it help to know that I googled duck bacon so I could have dock confit ads for the rest of the day? Yay! I feel like I have now arrived. I so picked the wrong time to temporarily give up meat. Duck bacon sounds fabulous. I love duck everything else, so why not? Easter, get here soon! Nope, I won’t be in town until April! Bring on the meat sweats! Did you mean meat sweats or meat sweets? It’s awesome either way. I meant meat sweats but meat sweets works too! Haha, good to know! You really do learn something new everyday. I totally stand by my prior statement – awesome either way. i have several linen or woven fine cotton scarves that i wear indoors – not sure if that’s within the definition of “knit.” if something looks like outerwear at first glance, then i wouldn’t wear it indoors, except possibly as a wrap to keep warm in a cold office. i can’t tell from the picture whether that’s the case with this scarf or not. I saw the D’Artagnan duck bacon at the grocery store on Friday and I was intrigued. Alas, I purchased the duck FAT that I used to fry Thomas Keller’s potato pave. Yummy. When I’m eating my frozen pizza tonight — I’ll wish I was eating with you instead. Funny how I can go from eating a frozen pizza to spending hours on a meal. And, sometimes a frozen pizza is just as satisfying. And I also like KFC, the single size servings of the Kraft mac n cheese, eating a whole bag of goldfish at once, making my nieces Oreo cereal as an excuse for me to have a bowl myself, and random types of convenience store potato chips. I’m not sure what my approach is….palette de laissez-faire? Smooches! And now I want a bag of chips and frozen pizza like it’s no one’s business….FWIW, Cook’s Illustrated has conducted taste tests on both potato chips (Lays kettle cooked original) and frozen pizza (CPK) so it’s our obligation to eat both to make sure they are right. I get what you mean, because any fuzziness in a scarf makes me think “outerwear” but my office is so freezing I do it anyway. I try to take off any scarf that looks like outerwear before a meeting, and this includes non-wool scarves too. I just bought this scarf in the ivory/charcoal. I like it, but it’s a lot lighter than I expected. Definitely wouldn’t pay $88 for it, but since I got it for $35 I kept it. The reviews say that the “charcoal” in the charcoal is more of a navy blue, and that the ivory part sheds…thoughts? Love this scarf, but shedding could be a problem. Please let us know! I love the colors of this red one. Would love to hear about the quality. Ellie – when you say “lighter” do you mean lighter color or lighter weight fabric? Lighter weight fabric. Color in mine is true to the zoomed in photo, but the weave is very open. Hmm, the charcoal does look a tiny bit navy, but I don’t know that I would have noticed it I weren’t looking for it. It’s actually very true to color to the picture, IMO, especially if you zoom in. It’s definitely not “ink blue” like someone said (at least, mine isn’t), and if it is navy I don’t think it’s so navy you couldn’t wear it with black. Just wore it around the apartment for a bit– I’m sure I looked awesome, doing dishes in my black wool coat and a scarf and pajama pants– and the ivory did shed on the coat. It was really small fine hairs, not like pet hair or anything. Something a lint roller would pick up quickly. Definitely not a $88 piece. And again, it’s really light. My question in the earlier thread is still in moderation, so apologies if this posts multiple times: NYC ‘Rettes, can anyone recommend a GP in Manhattan? I haven’t been to the doctor in ages, but think I should probably find one. TIA! Cool scarf! A few months ago I suddenly wished I owned more when I saw a youtube video of a gazillion different ways to wear a scarf. And now I have a question for you all. I’m meeting up with my long-distance boyfriend in Barcelona in a month, and we already found a place to stay in El Raval. What activities/sights should we not miss? I’d especially like to do some more active things, and I’m no longer a night-life person. I lived in a different city in Spain for a year in high school, but I only spent one day in Barcelona and barely remember it. And, oh my gosh, I can’t wait to see my boyfriend! And eat delicious food! Barcelona is amazing. Of course, I’m sure you know to visit every Gaudi building you can. Definitely make the treck up to Parc Guell. Amazing. I just love it. Besides that, I think Barcelona is a city where you just want to absorb the feel. It has amazing culture and a very laid-back feel. And great food! Walk down to the beach area, sip coffee at a patio cafe, etc. Also, spend some time on Las Ramblas; I don’t think it’s as touristy as some other similar places, like the Champs Elysees, although I still wouldn’t recommend eating there because it is much more expensive. We went to a restaurant called something about Cats that Picasso used to frequent, and it was delicious. I saw the same youtube video and went out and bought an awesome scarf at target the next day! haha. Barcelona — how I love it. Las Ramblas are fun, as are the big food market. Park Guell is so cool and a worthy addition to la Sagrada Familia for Gaudi works. The Picasso Museum is awesome, a must see. I was only there a couple days quite a few years ago, but those were the major things that stand out. Otherwise eat well and drink lots of wine and sangria! BARCELONA! I had the amazing opportunity to spend a week there after the bar exam last summer. It was so fun and amazingly awesome. My favorite thing there was the Miro Museum. It was so so cool to see an entire museum dedicated to one artist. We did not catch the Picasso Museum just because we’re not huge Picasso fans, but I’m sure it is the same idea. You can also walk around the Olympic Stadium for free. It’s just open. It was neat to see inside and to see the fountain and all outside. That was a pretty neat day because we did a walking tour of the whole area, which is a nice area (I believe that was also the Miro Museum day). Definitely go to Park Guell. If you go to Sagrada Familia, go EARLY. We got there about 15 mins before it opened and still had to wait in line for an hour. I’d recommend doing it first thing in the day so that your entire afternoon isnt’ wasted standing in a ridiculous line. And be aware that they DO NOT TAKE CREDIT CARDS (Sorry for the Ellen caps). The folks in front of us did not have cash, and they really won’t let you in. Like, for serious. My husband and I felt so bad for them that we would have paid, but we (by soem miracle) had only exactly enough to get ourselves in. I hated Las Ramblas, but enjoyed another area of town (that I can’t remember… near Casa Batllo). It has a lot of high-end designer shops. I couldn’t afford to buy anything, but the window shopping there was fantastic. Casa Batllo itself was pretty cool, and I’d recommend the audio tour. Ooh, the last thing is a good tip. I heard more stories of petty theft from people staying in the hostels in Barcelona then anywhere else in Europe (including Naples). Watch your purse like a hawk, don’t use internet cafes if you can avoid them, and get a cross-body bag with no zip (flap preferred) — but NOT a travel bag — that just screams steal me. Carry your actual essentials (passport, cash, and one credit card) in a bag attached to your body. When I was in Barcelona, there is also a fair amount of drug dealing and prostitution that goes on around the clubs and bars at night. Again, no violent crime per se, but something to be aware of. Oh! If you want active, you can also go hiking at Monserrat, which is a day trip from Barcelona. It’s not super challenging, but there are tons of great views and a monastery. If you want a “fun” hike within the city, you can go up to the Montjuic Fortress. The building was underwhelming, but it was great exercise walking up an enormous hill, and the view of the city from up there was a.ma.zing. You absolutely must go to a tapas restaurant called Quimet Quimet. It is out of this world. No English spoken. Get there immediately after siesta to snag a table (there are no chairs..entirely stand-up, but you want to have a table to put your stuff on). My favorite activity in Barcelona is just wandering around the various neighborhoods. – If you’re into exploring, try a day trip? Sitges has the best beaches; Tarragona has really neat Roman ruins and is a UNESCO World Heritage site. Both are reachable via train. Ah! La Paradeta! I was going to recommend that but couldn’t remember the name. This information is much more helpful than “You should go to this restaurant that’s down a little street with some construction next to it and you pick whatever sea food you want and how to cook it and they make it one at a time,” which was my first thought. I have SO many more like that, but I just can’t Google-stalk them! And dropping the little Google-map guy on streets in my old stomping grounds made me want to jump on a plane immediately, so I had to stop before I wasted all day. Thank you all! Planning this trip is so exciting. I’m sure doing it will be even more so! I will check out all your recommendations. Does anyone have any advice about interviews for private wealth management at big banks? I’m a law student, and they know that, but I’m still nervous about how much finance related stuff I’ll be expected to know. It’s first round, 30 minutes. Thanks! Not to scare you, but you may be asked word problems. I once had an interview with a small firm like that, and I was asked probability questions (I think mine had something to do with weather/if the probability of rain is this and the probability of completing a job on a sunny day is this, what is the probability of… etc.). I wear jeans and t-shirts all the time around the house (and out with the preschooler). My t-shirts are getting tiny little holes at the mid section near the bottom. It happens rather quickly and with a variety of brand t-shirts. It also happens to my husbands T-shirts in the same spot. It does NOT happen to my teenagers shirts. Any idea on what is going on? We don’t have moths and the holes are localized to only that small area. Friction with a belt buckle/hardware? Any chance it is where your pre-schooler’s feet hit when you’re holding him or her? This is a good theory- especially since the teen isn’t having the same trouble. Thinking of how to remedy other than to stop hauling him around. Will probably have to stop to save the T-shirts though. Its exceptionally aggravating to have to repurchase so many so quickly! Kitchen counter height? You could compare the height of your holes from the floor to the height of your husband’s holes – that way you will know if it’s from something stationary (e.g., kitchen counters) or something mobile and relative to your own height (e.g., toddler). One possibility is it’s your washing machine, but is a bit odd that it’s in the same spot for all of you. D’oh, just re-read that is is *not* affecting the teen. Yes, little baby toenails might be the culprit. Didn’t someone ask the exact same question yesterday? This happens to me too. I blame the button on my pants, mostly, and sometimes the cheap industrial washers and dryers in my building. I also think it’s where my shirt rubs against the counter when I’m washing my hands, cooking, doing dishes, etc. Opps. I asked the exact same question yesterday, but couldn’t find my post and thought I forgot to push the “submit” button or something. Sorry! The replies are on the second page of comments in the Weekend Open Thread. Oh I didn’t know it was you – I thought it was just a weird coincidence. You got a bunch of responses :). OP did but she posted late so I’m assuming she is reposting again in hopes of more responses. I think the quality of cotton has gone down. Your jeans are probably doing it. I have this problem too, I always blame my cat, because he likes to knead my stomach, and tends to hang out in my closet where my clothes are. Maybe it isn’t him after all. I’m looking for a nice work bag to carry my laptop and paperwork. Not interested in a briefcase or computer carrying bag. I would like something more stylish. I currently use a large leather tote from Coach. I’m looking for a style upgrade, any suggestions? Can you give at least an example of what you’re thinking? This is a pretty broad category. I use a large black Marc by Marc Jacobs tote and I love it so much I have no idea how I ever lived without it. I bought it this time last year and they don’t make it anymore, but he has a few similar ones out. I would look into his line if you’re looking to switch it up from Coach. What’s your budget? How big is your laptop? Ladies, I think tomorrow may be the day I switch from my winter to spring bag. I use a dark green patent leather tote during the winter (easy to wipe salt off of, looks pretty with my ivory long coat), and I am so. over. it. and excited for my teal Michael Kors spring bag (thanks, Marshalls!). I share this just because I know my husband and real life girlfriends will find me shallow for giving this more than two seconds’ contemplation. Yay! I broke out my yellow Tory Burch last week. I have been feeling spring-ish every day since. I smile every time I pick it up. :) I had been thinking of it all “winter” (in quotes bc, isn’t it still winter? ), but forcing myself to continue sticking with my staid black bag that I am less in fear of ruining. Would be happy to take that green tote off your hands. I know exactly what you mean! I am still carrying my black wool Kate Spade tote but probably only until after my trip to Boston next week, where it will still be winter. Here it is dreary and cold but supposed to be getting warmer daily. I wish it felt springy enough here to switch bags. We seem to be one of the only places in the country that has had a real winter. 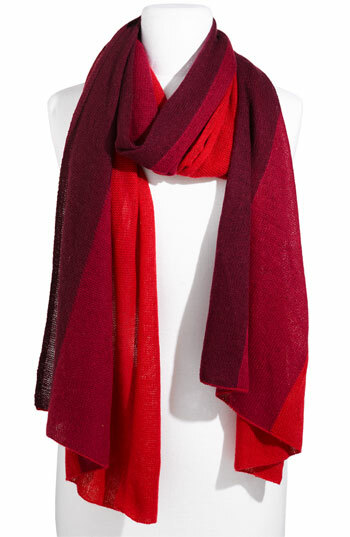 Just bought this scarf… my first corporette-recommended purchase (and my first Nordstrom purchase! Be warned, its a little like Pringles. Once you pop…its hard to stop. And that slogan could refer to something MUCH dirtier, which had never occurred to me until I just typed that comment. Pringles ARE dirty little buggers, you know. Mmmm… I could go elbows-deep in a can right now! LOL that reminds me of HIMYM where someone exclaims that Robin has literally fallen asleep while eating ribs. I once literally fell asleep with my arm in a giant bowl of Doritos. Yes! I have eaten through 4 boxes of Thin Mints and am working my way through the last one….I’m both relieved and saddened. How sick am I? They were in front of the grocery store on Saturday. Hurry! They had a thing at the mall this weekend. Like one of those things that usually sell weird iPhone cases or ugly jewelry. it was weird but also awesome. Send your SO to the Mall apparently. Or the grocery store. Or the nearest public transportation hub to you! oh no! I saw them Friday night outside the pizza place and on Saturday at the grocery store. Where are your girl scouts????!!!! On more reason why I gave up chocolate for Lent. I’ll pass on the Thin Mints but could eat my weight in Cadbury Creme Eggs! Yep! I ordered a box a few months back that was delivered to my desk today. Happy Monday to me. Any federal government lawyers out there (DOJ, AUSA)? Am considering government jobs, and am trying to figure out how much I would make on the federal payscale, how my benefits would compare, and whatI could expect if I needed to go on maternity leave relatively early in my federal career, before I had the opportunity to bank weeks and weeks of sick leave. Any insights? DOJ and AUSA are pretty much only hiring internally and “Special” positions, meaning, no pay at all. Thus, I don’t actually work there but I did look into it and have applied a few times. Basically, it’s hard to figure out what you would make because the fed payscale takes a lot of different factors into consideration, most likely we’re not going to be able to figure it out over the ‘rette. Benefits are pretty good, and if you just google the position you’re looking for with “job specs” or “benefits” you’ll probably come up with info. If you need to go out for maternity before banking weeks and weeks of sick leave, then you can’t take weeks and weeks of sick leave. You’ll be able to take up to 12 weeks unpaid leave under FMLA, and many offices will work with you to get more unpaid time, but you’ll have to burn all your paid time first. That’s about as in depth as I know, hopefully someone else has more info! Thanks. This is all consistent with what I’ve learned so far — I keep hoping that I’ll find someone who can actually walk me through some of these things. Am in BigLaw now with my wonderful maternity leave policy, and am trying to decide if it’s irresponsible to move to gov’t and give up the opportunity for paid maternity leave with a (potential) second child. I find it somewhat shocking that the federal government doesn’t provide any maternity leave benefits at all. Also, I think those “Special” positions are insulting. I agree re: “special” positions. And I noticed about a year ago when I was looking that several DA’s office near me are doing them too. One thing to note about the gov is the retirement. I don’t know your deal in Biglaw but my previous employer gave us access to a 401(k) with no matching (generous, right?) and after a couple years I realized it actually still did not have even the amount of money I had put into it due to stock market losses. I wished I had realized that earlier and just put it all in an MMA or CD. Now, however, I have 2% at 55 and feel a real sense of future security. Your maternity leave would be whatever sick leave and annual leave you’ve accumulated. Most offices will also let you take several months of unpaid leave. Although I have not had children, as a new employee, I used my sick leave and annual leave to cover a period of illness. I had to return at a certain point because leave without pay would mean a loss of health insurance. Perhaps this is different for maternity leave. Also, people can donate their leave to coworkers in need. We occasionally receive solicitations from people in need of leave (illness, ill relatives, etc.). It’s all public information — you can look on OPM’s web page to find leave & pay information. If you want to be walked through it, find an alum of your law school who works at one of these offices & set up lunch or coffee to talk about it. Most of us are happy to recruit and share information about federal employment. As already mentioned, DOJ has a hiring freeze right now, and has no maternity leave. If you don’t have leave in the bank, you have to go unpaid. Once you’re been there for a while, it sort of works out. I took 6 months off with my first, and it ended up almost all paid because I had tons of leave and was able to transfer leave from my husband (another fed). My second was 8 months, but much of that was unpaid because I’d used all my leave with baby # 1. The 401(k) is apparently comparable to the private sector and the government matches 5%. It’s not a happy time to be in the federal government, though. We’re on our third year of a pay freeze, and every time I turn around Congress is working on some way to cut pay or benefits for us. Depending on the job, you may have more flexibility once your baby arrives than you do at a firm. Also, the financial regulatory agencies have a special pay scale that goes higher than the GS scale. Insurance benefits are good in terms of coverage, but I really can’t compare costs because I have been a fed for so long that I don’t have a frame of reference. You also earn a pension as a fed, although it is not as significant a portion of retirement income as it used to be for Feds. I looked into this at my agency and learned that at least there, it’s at the discretion of the supervisor whether you can take sick and/or annual leave in advance (i.e., before you accrue it). If you start out with nothing and are getting 13 days annual leave and 13 days sick leave a year, having a year advanced could make a big difference, but it may be hard to know before you make the switch what you’ll actually get. OP here. Thanks, everybody, for this. I really appreciate the comments. The job I’m looking at seems to be on a different-than-standard-payscale, and there’s also locality pay in place. So confusing! Building on the earlier post, I’d love to know how much everyone pays for their cleaning service (I often wonder if I’m getting ripped off). Post your city, home size, cost, frequency, and whether it’s a service or an individual. DC, large studio, $90, monthly, service. Oops, 2.5 baths! I always forget the guest bathroom downstairs because we rarely ever use it. Boston suburb, 3000 sq ft, every 2 weeks, $150, individual. Silicon Valley- 3 bedroom, 2 bath, $180 for 2 cleanings per month. Dallas. 1100 square foot condo. $90 per visit. She visits every 2 weeks. Individual. Cleans everything (I pick up everything–she cleans), does the laundry, does dishes, and irons. My place looks AMAZING when she leaves. Berkeley, 2800 sq ft, $145 every other week. Any Seattle recs you want to pass on? I am Seattle – I have a recommendation for an individual. I used to use April Lane and I really didn’t like them – I had problems with them canceling, rescheduling, showing up when I had canceled the service (in writing) months beforehand and expecting payment…I’m sure they are great but for me, they didn’t work out. Please let me know where I can contact you to give you the individual’s contact info as I don’t want to post her email on the WWW without her permission! How big is your house? And where? I pay $60 biweekly to an individual for my 1200 square foot house. 1200 sq feet in the Oak Forest/Garden Oaks area. Have friends in midtown who use her and pay a little more but they have stairs, and she does dishes for them. DC, 1 bedroom, $80, every 3 weeks or so. Dallas suburb. 4000 sq ft, 5 br, 4 ba. $125 once a week. No laundry. Individual (brings her sister-in-law to help though). 4000 sq ft! woah! that’s allota sq ft. I’d get lost up in there. :-) Everything is bigger in texas. NYC. $110 for a 850sq ft 2br/1bath. Since I use a service, I tip the cleaner personally $20. My in-laws pay more than $150 for a 2br/2bath in NYC, they use an individual cleaner. NYC. Every two weeks or so, with an individual (who treats the roommate and I like we’re her children – love!). $175 for a 1000 sq ft 2br/2bath, previously $125 for a 700 sq ft 2br/1b. NYC. $100 for every week. 850 sq ft 1 bed / 1 bath. She also does sheets / towels. Glad to hear what the other NYC ladies are paying — DH insists we overpay. NYC, $80 per cleaning for 2 bed / one bath (we clean up, she cleans). Every other week. Now that I’ve seen what others are paying I’m going to give her a raise. NYC. $80 per visit for a ~700 sq ft 1br/1 bath. Individual that comes every two weeks. She changes and washes our sheets, towels, and bath mat. She does a fantastic job and is very trustworthy, I love coming home to a spotless apt on the days she comes. Silicon Valley, 1 bed 1 bath (~850 sq feet), $75 per visit, they come every 2 weeks. Anyone have any advice on “taking care of” or “feeling responsible” for a parent following a divorce? My parents divorced a little over three years ago (my dad left my mom). While it was really, really hard for all of us, it was especially hard on my mom. She was devastated, and I did a lot to be there for her in the beginning. I was in college at the time but I still called her everyday and went home to visit (90 minute drive each way) a lot (as in every weekend, if not every other). As the months went by, I stopped doing as much for her. Some of it was because life got in the way (I graduated from college and got my first “real” job, my first apartment, started dating, making new friends, etc.) and some of it was because I realized that I needed to stop taking care of her so much. I was feeling solely responsible for her emotional state and I needed some distance from that, so I went home less and called less frequently. Now, three years later, my life has changed a lot since the divorce, and mostly for the better. I have an amazing new boyfriend, a great new job, and wonderful friends. I travel and exercise and really love the life that I built for myself, and can appreciate it all the more after the devastation of the divorce. However, little has changed for my mom. She’s doing great professionally, but personally and emotionally, not so much. She and my dad are now officially divorced but in an ongoing battle over financial assets, which is really hard on her. She’s doing online dating but she’s very picky and honestly it doesn’t seem like there’s many great guys out there near her age. Whenever I talk to her, I feel awful that my life is going so “well” while she’s lonely and stressed about money, even though she is happy for my happiness. I feel guilty for being happy when she’s not, which, as a result, makes me not want to reach out to her. When I do reach out, I then feel bad and stressed because I worry about her. It’s this weird vicious cycle. When she calls or texts, I actually feel a physical response, like a tightness in my chest. I don’t want to answer the phone because I don’t want the responsibility for her emotions and her happiness anymore. I don’t want to feel guilty for telling her how well my life is going, when hers isn’t, even though I know she’s happy for me. However, I also feel like without telling me, she has no one to talk to (she was going to a therapist but her therapist passed away recently), and that’s not fair to her. She’s been so wonderful to me my whole life that I feel like I owe her this, but at the same time, I just can’t deal with it anymore. I feel like I’m doing a terrible job articulating how I feel, but this whole situation is very confusing for me. Does anyone have any advice? No advice but my heart goes out to you. It’s so difficult to play such a role in your mother’s life and I’m not sure if you really should. Have you considered counseling for yourself? Or joining a support group for children of divorced parents? Second AnonOne’s advice. That’s a really hard situation. You didn’t mention, do you have siblings? You might be able to lean on them a bit, or at least form a mini support group for yourselves since if she’s leaning on you so much, she likely is them as well. What about your mom, does she have siblings? It doesn’t sound like this is anything she’s really doing (i.e. she’s not TRYING to guilt trip you, you just feel guilty because you’re doing so well and she’s not) so there isn’t really any value to sitting down with her and expressing any of this, it’ll just make you both feel worse. Definitely definitely encourage her to find a new therapist, also, instead of online dating, you can encourage her to join things or events where she would make friends. It sounds like your family was her whole world and now nobody really needs her anymore. You’re doing great, your dad has moved on, etc… So exploring some of her own interests might help. I have a younger sister, but she is, for lack of a better word, a trainwreck. She’s out of the “nest” but very much lacking in any sort of emotional maturity or real life common sense. She’s more of a source of stress than any sort of help, unfortunately. Your last paragraph is spot on. I do need to keep encouraging her to get out more. Having more friends, even without a romantic interest, would probably be good for her. Our family was definitely the center of her universe and I think she is struggling with no one “needing” her any longer. Yeah, the situation sounded familiar. My mom was not working when I went away to college, and my brother then accelerated his high school and went to college the year after me, my sister was pretty much a wild child and couldn’t (and still can’t) be less concerned with anyone else’s feelings (literally, I’m not being bitter here, though it sounds like it, that’s just who she is) and my dad was having financial issues and thus was at the office ALL the time. My little brother (all of 11 at the time!) used to call me around dinner time to tell me “mom broke down in tears at the dinner table AGAIN tonight.” because it would just be the two of them, it was really rough on him, and I would feel bad because I was 8 hours away and couldn’t come home every weekend. Then she would call me and tell me everything was fine and she was just feeling a little down, and how was I doing, and all the time I can still hear tears in her voice. Ugh, just talking about it is making MY chest feel tight and it was 8 years ago! Honestly, the best thing my dad ever did was tell her it was time for her to get a job. With 2.5 kids out of the house and the final 2 in high school she just wasn’t as needed at home anymore. It sucked for her at the time, but 8 years later she is 10x happier than I’ve ever seen her. Maybe your mom can take a class at her local community center, pottery or painting or gardening or whatever she might be interested in. I’ve even seen some “basic home repair” classes that I swear are for the fresh out of school or the newly divorced who have to suddenly shoulder the entire burden of keeping up a residence. Maybe a computer class, or volunteer at her library or animal shelter (maybe she can find a furry 4-legged care-taking-needed creature!) or for something like Boys and Girls club where she would still get to work with kids, if that’s what she misses. Yes, I went through counselling for myself following the divorce. I went off and on for about two years. It really helped me let go of my anger surrounding the divorce and work through my own feelings on the event itself and my beliefs on love and marriage for myself down the road. I touched on the issues with my mother and my therapist helepd me give myself permission to stop doing so much – all of the calling and driving. However, my mother has a lifelong pattern of being emotionally needy and I’m one of those people who always tries to take care of everyone else. It’s just a bad combination of personalities and an incredibly complex issue. Logically, I know I’m not responsible. Emotionally, it’s a different story. With this information, I have two suggestions: 1) that you go back into counseling specifically to learn effective boundary-setting. It’s a skill that will serve you well in many relationships, not just with your mom; 2) read “Boundaries” by Cloud and Townsend. It’s written from a biblical slant, but if that’s not your thing and you can substitute “wisdom of the ages” and “higher power” where appropriate, there’s lots of good stuff there. I agree with Seatleite, you need to learn to set boundaries with your mom. Reading Boundaries really helps, and talking to a behavioral therapist about setting up boundaries with people will benefit you in the end. I have learned how to do this with my own mother over the last few years, and it has helped my relationship with my husband and friends as well. Generally parents like to hear that their children are doing well – if she’s happy that you are happy, why should you feel guilty? Happiness isn’t a zero sum game. You not being happy isn’t going to bring happiness into her life. Background: I have been (happily) divorced for 18 months and have a college-senior daughter. Your mother is leaning on you to an unhealthy extent. Your body knows this, thus the physical reaction. I am certain that if your mother were emotionally healthy, *she* would be horrified at the burden she is placing upon you. Please consider saying something like this: “Mom, i love you and desperately want you to be happy. But I don’t have the skill to help you through this, and I don’t think that what we’re doing is helping either of us to heal. Please see a counselor.” You’ll probably need to say this every time she starts the sad conversations. (If you’re up to it, it would be a kindness to give her two or three names of therapists, perhaps obtained from your mom’s doctor.) I picked that wording deliberately to help her see that while you’re doing well overall, the divorce affected you too, and it’s not fair to burden you with her troubles. Your happiness is NOT coming at your mother’s expense. It is NOT. Please do not feel guilty for the fact that you are doing well. Since the divorce was not her idea, she is probably wondering whether she wasted her life, etc. It would be a kindness to let her know how much you appreciate her, and that you have faith in her. But there’s a difference between expressing those things with the frequency that feels authentic to you, and feeling responsible to keep validating her so that she can function. If *she* were asking my advice, I’d probably tell her she doesn’t seem ready to date yet, but IME daters gonna date, so what can you do. “Daters gonna date” made me lol. For the second to last paragraph: Thank you, thank you, thank you for providing that perspective. I will also check out the book you recommended above. And honestly, thank you for noting that you are happily divorced. I’ve been conditioned think of divorce as The End of the World, and am consequently terrified of it. A reminder that it can happen and you can still thrive is always welcome. Anon, I was conditioned the same way. It was a long and lonely journey while I figured it out. And the big hurdle was worrying that a divorce would Ruin My Children’s Lives and Destroy All Their Chances of Success in Love and Life. I know a lot of people worry about this. I can say that my childhood after my parents’ divorce (I was 11) was much better than before. No more fighting. Better adult/marriage role models. No more yelling in the house. I don’t have kids of my own, so I can’t comment on what it feels like to know that your kids’ stepmom is trying to give them good role modeling. But I would like to think that it helps that I am trying to do the right thing. I have a similar dynamic with my mom. She is widowed however. I also have an immature sibling. My mom works and has friends but I seem to get the brunt of the emotional dumping which usually consists of her coworker issues, boss issues, the health conditions of everyone in our neighborhood, my cousin’s third divorce, etc. My mom has always been on the negative side and anxious about money and everything. It is just how she is. I struggle with phone conversations and visits and I get the same tense feeling you describe. I try to keep the conversations light about shared interests (cooking i.e.) and while I will listen to some grips, I change the subject after extended negativity. But it is a vicious circle of me not calling because I don’t want to deal and then me feeling guilty for not calling. I have tried to deal with this by accepting my mom for who she is, lowering my expectations generally, and telling myself that while I love my mom, I love myself too and I deserve happiness. I don’t beat myself up if I just decide not to answer the phone because I am not in the mood for negativity, and call her back when I’m in a better frame of mind (such as… after a glass of wine). Thanks for your honesty. It’s nice to know I’m not alone in this. Same here, word for word. My dad passed away about 5 years ago. My mom (who lives 10 hours away) is and always has been supportive, doesn’t try to guilt me, etc., yet I dread calls from her over the past few years due to her negativity. She doesn’t work, and though this limits the scope of her negativity, I think it makes her more needy in that she has very limited social interaction with anyone. It’s exhausting and the self-induced guilt about the situation just eats me up. Therapy helps. Oh, I have a lot to say about this. My bottom line for you is that it is not your fault that your mom is alone, it is not necessarily a bad thing that your mom is alone, and you must do your best to pursue your own life and recognize that your own life does not come at the expense of your mom’s life. When my parents divorced (my dad left my mom), I was strongly on Team Dad for years (middle school through post-law school). He used me (NB: I did not say “leaned on me” or “depended on me”) to do a lot of things that adults should do for themselves. It was useful to me in the sense that I learned at a very young age how to deal with roofers re-roofing the house, preparing documents for buying a house or having our taxes done, making dinner reservations, dealing with the housecleaning service etc. However, it meant that I was way too enmeshed in my father’s life. Not healthy. Not healthy for him because he didn’t do his own stuff himself. And not healthy for me because I was doing his life instead of doing my own life. Even now (I am in my 40s), when he demands that I do something for him that I *know* he should do himself, I still feel guilty for saying no. That is a direct result of too much enmeshment. My husband and his former wife got divorced several years ago (before I met any of them). She left him. (Digression: boy, am I glad she left him for me to find!) Since then, he has really gotten his life together and is self-sufficient and happy. She has not (she has been through three fiances/almost marriages in five years, her mom helps her financially, etc). Her daughter/my stepdaughter is 16 now, and has unfortunately taken on the role of “mom’s caretaker.” If mom is unhappy, SD must cheer her up. If mom is anxious about something, SD must soothe her. If mom is angry, SD must allow herself to be yelled at. Not only is it very unhealthy for SD now, but we are concerned that it is creating a pattern for SD that SD will follow in all her important adult relationships such that she will allow herself to stay in unfulfilling relationships where she is being used instead of cherished. SD’s therapist is trying to work on this with her, but it is delicate (how do you tell a kid that her mom is sick without risking that the kid will not listen to another thing you tell her?). In the meantime, we have read tons of books, the most relevant of which for you might be Christine Lawson, “Understanding The Borderline Mother.” Lawson discusses four kinds of mothers, and you might recognize your mom as the “Waif.” I can’t tell from your post because there just isn’t enough data, and I certainly am not saying that your mom has Borderline Personality Disorder. However, some of the coping tools for daughters of waif moms might help you. From memory, one is along the lines of: “If your mom calls in a panic about something, calmly ask her to explain the situation and, once you determine that it is not an emergency, tell her that you are confident she will be able to resolve it herself.” Two benefits: (1) you aren’t running around doing her business instead of your own life, and (2) eventually, she will learn how to take care of herself. It’s possible that reading this might alleviate some of your guilt. I posted once here about my father’s comment that I was “still” single at 31 after a divorce at 30 because I was “too picky.” I ended up being single from 30 to 40, and I wouldn’t change that experience for anything now. They were wonderful, selfish, adventurous years. In other words, being single isn’t a disaster. Your mom might enjoy aspects of it. I hope that you find some solace from everything people have written here. Good luck. Thank you so much for taking the time to share all of that with me. It means a lot and it truly does help. This is so helpful for me as well. I’ll look up that book also.. Same situation but have been in it way longer than you, as in mother has not gotten over dad leaving her and from all indications never will. Difference is that she was not a great mother due to emotional problems. These led to the divorce essentially. The only thing that has worked is setting boundaries. I keep my guard up around her a fair bit as she is sometimes quite mean and judgmental, I think due to being unfulfilled in her own private life. Not great but that’s how she is. As far as what she can reasonably expect of you – think about what you would expect of your own child if you were going through a divorce. I like to think that I would not burden my child with my adult problems, especially when they involved that child’s father. I want to thank the OP for posting this, b/c it’s made me feel better that I am not alone in having a mean, negative mother, or having to deal with so many adult issues even when I was a child, which resulted in my not being able to “play.” From reading self-help psychology/relationship analysis books, I’ve found that it is actually not healthy for children (even adult ones) to help shoulder their parents’ problems – and that some lines between parents and children are not supposed to be crossed. I just got a Drama Class Cowl from Ureshii on Etsy and I am in love with it. (www [dot] etsy [dot] com / shop / Ureshii) Custom made to my measurements, dreamy lightweight knit Merino, looks fancy but feels like jammies. OMYGOSH KANYE. As per thehairpin’s instructions, I looked up wedding shoes on etsy. The glittery joy that met my eyes was TOO MUCH TO HANDLE. MY GOD. OMG RU DID YOU WATCH THE STUPID OSCARS? I’mma let you finish, but Sharmeen Obaid-Chinoy had the best Oscars dress of all time. OF ALL TIME! Kanye, heart heart. I have been waiting for the day you would make an “I’mma let you finish” joke. YES, I DID SEE THAT PART. Her shoulder jewelry distracted me a lot. I kept wondering if it felt like someone was tapping her on the shoulder. Fashion watch fail? Even better that she’s from Prince Edward Island! I have one in last year’s jade green and love it. Perfect size and weight for an indoor/all-season scarf (vs. woolen). Ooh, thanks for posting this. I love! But if I get one I think I have to get rid of some of my others…mentally going through my closet right now to begin the justification process! Speaking of which, I’m feeling some guilt for getting rid of an amazingly ugly scarf that a super-fashionable friend got me several years ago. I’m just reminding myself that a) she wouldn’t care, b) she never has to know that I hated it, and c) I’m donating it so someone who actually likes it can actually wear it! I work for a small lawfirm. We are changing health insurance. The new insurance application has a mandatory Health Questionnaire that pretty much asks for everything that was ever wrong with you, but there are no exclusions for preexisting conditions. Why do they want this information, and is it really mandatory? They may be able to charge your employer more for your premiums, but not exclude you from benefits. Laws about this vary by state. If you’ve ever had health insurance, everything you had office and hospital visits for is part of your health record anyway. If there are not exclusions for preexisting conditions, then the only risk to you is if you conceal something. If you don’t disclose X, and it later comes out that you should have, then the carrier might have grounds for refusing your claims. My company just did this same thing. We are a GIANT BANK, and they bribed us to take the health assessment with money for our new health savings accounts. I get the impression that if they can get a good percentage of all 300,000+ of us to answer the thing, and then show the new insurer how healthy and safe we are, they will get a cut in premiums. Yes, I believe that they can use this form against you to retroactively cancel your coverage. (My family has experienced some insurance company horror stories, so we’re very cautious.) In a case like this, they can use almost anything to cancel you if you come down with an expensive medical condition. Even things that you forgot. If I remember one of the articles I read a few years ago correctly, one guy was canceled because he didnt’ disclose something like a broken arm in his teenage years, which couldn’t have had anything to do with the cancer or whatever it was that prompted the “review” and cancellation of his policy. So I would write down everything you can remember, and then include a statement that you’ve provided all information you can reasonably be expected to remember, and that you have not purposely not disclosed anything. If you end up in a court battle, maybe that will help…. And since it’s not an individual policy, you probably have less to worry about in this area. But I think it’s good to be cautious. The whole health insurance system in this country is criminal. Criminal. My parents pay $1000+ a month (and at one time it was $3000) for a policy with a $10,000 deductible. And if you know anything about how deductibles are calculated (using the insurance company’s “negotiated rates” even if you are paying 5x that), then you know that they basically have little more than a catastrophic coverage policy. And if they ever have to use it? I’m sure that there’ll be a battle to fight cancellation. It’s sick. It’s sad that for the last 5 years they’ve been counting down to hitting 65. Anyway, I’m late to the thread, and you probably won’t even read this. But I wish you the best of luck. It’ll probably be fine. Just be thorough and consider adding that little caveat statement…. Oh, hey! Thanks for the heads-up on the scarf. I had this on my Christmas list and did not receive it. Merry February Christmas to me! cbackson – I came late to the morning thread, so in case you didn’t see it: seattleite [dot] training [at] gmail [dot] com. I’m taking the bar exam tomorrow/Wednesday and trying not to freak out. Send me good vibes if you’re bored at work tomorrow!! Good luck! Make sure you get a good night’s sleep and stay well nourished and hydrated! Universe, please pass on some niceness to this and all other Corporettes currently taking the bar. Go kick @$$ youngun. Anyone else have a favorite scarf tying site to share? Hermes has a few downloadable PDFs on their website. Don’t know how many people are going to see this, but I have to share the “misery” (wink, wink!) I am obsessed with trashydivadotcom. They have such beautiful clothes and if you can get away with some creative fashion at the office I would definitely recommend looking. I would classify it as modern vintage in great patterns and colors. They have a brick and mortar location in New Orleans, but I think their website offers a great selection. Join me in my obsession please! I am a happy part of that club. I have two Trashy Diva dresses, one of which is work-appropriate, and I am constantly trying to decide which dress to get next. Have never been to New Orleans but if/when I go, their boutique will be one of my stops! Oh my god I want this! May be my reward for getting down to a size it’s made in! Not for work, I know. Oh my goodness, these dresses look amazing! Can you speak to sizing? Stunning dresses. I see a few dresses I could wear to work too. OMG…there’s a shop by print option, and you can shop specifically by LEOPARD print. Haha….that tickles me pink for some reason. No, it’s not. There’s one on Chartres near the Cathedral and one on Magazine St. in the Garden District. The two malls near the French Quarter are Canal Place (on Canal) and Riverwalk (along the river). Sounds like it might have been Drizzle in the Riverwalk? O M G my toes are so cold I cannot even feel them. Help! It’s not just today. It’s almost every day. I cannot use a space heater. It causes some sort of electrical issue with our server (niiiice). I cannot make my office warmer because it will roast the two offices next to me. I have wood floors and two of my walls are mostly windows. It’s really pretty but is a recipe for purple toes. I’ve tried dressing in layers but it’s so friggin cold that doesn’t work (plus you can only put so many layers under a suit). I’ve resorted to wrapping a blanket around my lap or even crossing my legs in my chair to tuck my toes in… real professional, I know. I can’t wear heeled boots every day and my standard heels are obviously not cutting it. It’s gotten so bad that I’m switching offices but cannot do so until that office vacates in 8 months. In the meantime, I stand my my secretary’s desk to thaw my toes out every few hours or so. Does anyone have any tips? I’m dying over here. Do you really have to keep your shoes on at all times? Socks? Warm slippers? Hot water bottle for your toes? YMMV, I’ve found that my humidifier is much better at “warming up” a space than a space heater. The fire department likes me better too. Are you allowed to use microwaveable or electric heat pads? I don’t know how this would work for you, but in my old office I kept fluffy slippers under my desk. If I wasn’t wearing boots with socks, I would slip off my shoes and be 10x happier than even when I was wearing boots! I did have to be alert when someone came into my office (usually kicking off my slippers and going back to shoes immediately on the off chance they would come around my desk or need me to go do something suddenly). Honestly though, one of my coworkers brought in a snuggie and although everyone joked around a bit, nobody thought it was unprofessional (as long as it stayed in her office) and we were all a bit jealous that she was that bold. Heating pad. Most of the ones made today turn off automatically after 60-90 minutes, so no fire worries. It’s the only thing that got me through school. I carried one from class to class and sat on it. I’m sure everyone thought I had the Most Public Case of Cramps Ever, but it sure beat being knotted up in pain from the cold. Get those hand/foot warmer things you can get when you go skiing. When I worked in my nice, unheated workplace in Japan, they were an absolute lifesaver. The glove-sized ones are fairly small and should easily fit in your shoes. I keep a pair of shearling slippers under my desk and slip them on when I’m at my desk. I’ve been having a similar issue with my two-walls-of-windows office all winter. Same issue with the thermostat, too. Warm enough for me means roasting the middle offices in my row. I am not supposed to use a space heater, but I do. Some months ago several posters recommended the little Vornado heaters as being low wattage and unlikely to interfere with systems electrical. Short of that, I would go with cashmere socks. I’m sorry, I feel your pain! Okay, why did I not already think of all those options?!? You ladies are brilliant! I will purchase myself some slip-on slippers asap and I will run to CVS tonight to get a heating pad. I can stick it behind my back or even sit on it (lol) to get warm… it’ll be just like my seat heaters in my car… but not. Thank you so very much! You have saved my toes from being lost to frostbite. It’s hard to think with cold toes. I’m serious. All you can think about is how cold your toes are. Heated lap throw. Just like an electric blanket, but only about 50″x60″. Guaranteed it won’t mess with the servers. Space heaters usually work by cycling on and off both a heating coil and a fan to blow the warm air toward you. The sudden surge of power used by the coil can cause the voltage on the circuit to drop briefly. Really sensitive electronics may then trip off. In our home, the most sensitive piece of electronics was the stupid coffee maker. When our electric heat went on, the old coffeepot lost its mind, resetting its clock to midnight. No biggie, I can live without the clock, but it WOULDN’T BREW COFFEE until we set the clock. Every. Single. Morning. Since I can’t possibly fiddle with tiny clock buttons before my first cup of coffee, that machine went to Appliance Heaven. The wood floors are part of it, I’m sure — could you put down a throw rug and then a plastic mat on top of that (if you want to be able still to roll around in the desk chair)? On sale at Nordstrom in blue!! Whooo hoo. YAY! I think Bunkster was waiting on this color, too. Thank you, ladies. I caved and bought it, even though I shouldn’t be spending money right now. I also really like the new emerald color. Question for the hive: My boyfriend is leaving for a two-week business school trip to Asia, and I wanted to get him something small and useful for his trip. Thoughts on what that should be? Thanks! –Phrase book for countries he’s visiting. –One of those little charging matts for his various electronic things. –Gift card for music for his iPhone or e-books for an e-reader. –Travel pillow, blanket, etc. – its a long flight. Definitely looking on the thriftier end, but these are great ideas – thanks! Travel picture frame with a photo of you or you and him inside? Hand towel or handkerchief. A lot of public bathrooms in Japan don’t have paper towels or dryers, and you are expected to provide your own. I’ve heard the same for China and South Korea. Make sure he has nice socks. Many places in Asia are shoes off inside and you wear some sort of slipper or just wear socks, so you want to make sure that your socks are not totally disreputable. For those who are in-house, how did you land your position? I’m at a firm right now and am interested in getting advice. How many years were you at a firm? How was the in-house interview different than a law firm interview? I’m in IP litigation, if that matters. Don’t know if you are still reading the thread, but I recently did this. I was at a boutique firm doing IP litigation. I was at my firm for four years and landed an in-house trademark position. I can’t say enough how great the switch has been. I feel like a new person. I was very lucky to find my position. My sister-in-law works at the company and alerted me to the opening before it was announced to the public. I sent my materials to my now boss, and the position was mine two weeks later! I had three interviews. The first was a phone interview with the other attorneys in the trademark group. That interview consisted of a lot of questions about the kind of experience I had and what skills I had already mastered. The company flew me out for the second two interviews. For the first, I had dinner with two of the trademark attorneys the night before the interview. The next day, I interviewed from about 9am to 4pm with attorneys from many different specialties in the legal division and with the VP of the division. The second interview was similar, and I was supposed to meet with the GC, but he had to rush out of town. The second and third interviews were much more relaxed and more of a get to know you sort of thing, but one of the attorneys asked me to formulate an opinion so that the group could evaluate my skills. Good luck with the transition! I would be happy to chat with you further via email. Let me know! Yes, please. I’d love to discuss. Let me know where to email you.